Editor's Note: Giambrone writes and edits The Political Film Blog. His work will appear here regularly. There are a handful of directors who always prompt me to venture out and endure the American multiplex experience. These are James Cameron, Darren Aronofsky, Terry Gilliam, Michel Gondry, Jean-Pierre Jeunet and Baz Luhrmann. Now I believe Gatsby is a good film, and you should see it, but it’s not a truly great film. I also believe that I’m onto why that is, which will take some spoilers, after the jump. 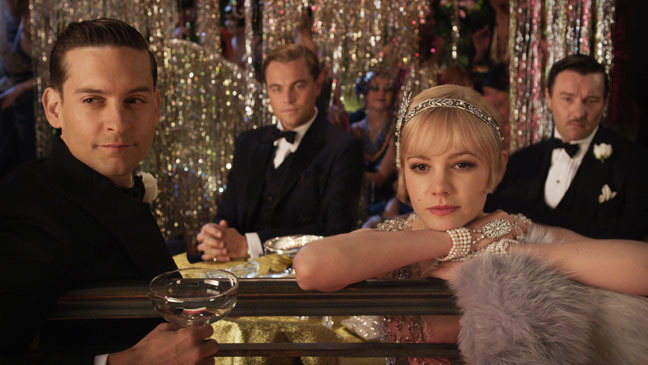 Baz Luhrmann went to exceptional lengths to engineer Gatsby in his image. He committed to a 3-D experience, and it shows. The usual 3-D chicanery pops out and slides by, almost constantly. This I didn’t mind, and it makes for another element to keep the eyes from getting too used to the view. That’s not such a bad thing. I saw Life of Pi in 3-D as well, and sat mesmerized the entire two hours (better film by the way). Luhrmann’s exceptional efforts here apply to the story as well, and he acknowledges expanding on the original text. His team used notes and as much primary source material as they could find to construct the narrative and make it more film-friendly. The Nick (Tobey Maguire) character – narrating – was expanded on. Not sure if this expansion was sufficient, as there is a disconnect between Nick’s life during the summer of Gatsby, and his present moment supposed urgent need for psychological therapy. Some steps may have been overlooked concerning that transition. The film is long however, and expanding further is always problematic. Not only is she not listed as a “star” of The Great Gatsby over at IMDB, she doesn’t appear on the list until the 41st spot! I counted. She’s the protagonist! It is her decision, to choose between Gatsby (Leonardo DiCaprio) or Tom (Joel Edgerton). It is her choice that undoes Gatsby and is the entire story fulfilled, the underlying class conflict, the crushing of dreams, the cold reality to Gatsby’s fantasy delusions – which he actually made sort of real for a while. How could such a key part of the story wind up 41st on the list? Because, like the other metaphors and analogies floating around in this 3-D fantasy world, Daisy's character was overlooked and underdeveloped. Think about the story of Gatsby from Daisy's POV. So, are we to think of Daisy as a prize, a reward, an object, a prop? Can’t ask Fitzgerald, but I do believe that Luhrmann may have flubbed this one. The blame has to go somewhere, and since he saw fit to expand Tobey Maguire’s character to unneeded degrees, we must ask why Daisy got such short attention here? Is it a gender thing? Subconscious favoring of the male roles? Lost in the testosterone? Let me explain the plot, for those who may be lost at this point; I did mention the spoilers. Gatsby has created a palatial wonderland across the bay from his lost love Daisy’s mansion. He has hooked up with bootleggers, gangsters to do so with inroads into Wall Street. He introduces politicians to crooks and profits handsomely by doing so. His sole desire driving him is that Daisy will show up at one of his legendary open parties full of outrageous consumption and ostentatious grandiosity. Every weekend is a free for all, but she never comes. He cannot approach her directly, as she is married to another millionaire, Gatsby’s rival Tom Buchanan. Now Buchanan is a patriarchal philanderer with “old money,” one of the blue bloods who looks down on upstarts like Jay Gatsby. This class / money brinksmanship is central to the story. Because Daisy also comes from money. Here is where the ball is fumbled. Daisy’s character is never cemented at the beginning, her starting position. We don’t know anything about her at that time, because Baz didn’t include it. There is one throwaway line from Daisy’s mother about gold digging for people of good breeding. Daisy is shown as a debutante. She wears the dress anyway, but she doesn’t do anything, say anything, have any scene to express who she was then and her attitudes about class, money and elitism. All she does is fall for DiCaprio’s pretty boy face and that’s that. Daisy’s character lacks the essential point of view that would later inform us of her big decision. Because right now, Daisy has some disconnects. One problem with her climactic decision is that it’s a non-action: she doesn’t call Gatsby. This is an expression of her rejecting Gatsby in favor of the cheating brute Tom, but it could go either way. Actually, it felt like it should have gone the other way, and she should have followed her heart and gone with Gatsby, the more deserving man. Her character as filmed would have gone with Gatsby, not Tom, or even off by herself instead of with Tom. Tom was third place, not first. That’s because Daisy wasn’t set up as part of the old money establishment. Daisy, in the end, decides in favor of the established order, the class system, the conservative institutions. Gatsby wasn’t of high enough stock. Despite that Gatsby did everything for her, that he covered up a hit and run manslaughter for her. Nothing Gatsby could do was enough to overcome that hurdle of so-called breeding. How to reconcile this Daisy with the Daisy we’ve seen on screen for two hours? She wasn’t established to make that choice. She wasn’t established to reject true love, either. Daisy was ready to run away with Jay, no questions asked. She slept with him and cheated on her husband repeatedly. She cherished Gatsby and their initial love affair five years ago more than anything else in that world. The only answer is Gatsby’s failure as a gentleman of superior breeding, but it was never made clear that this would mean something to her, that it was a deal breaker. One could argue that it’s made clear by the end of the film, but this is done poorly by Nick (Maguire). After the climax Nick has to try and explain why. We don’t know why as it’s happening. The why is confused, muddled, and hard to nail down. Was it supposed to be? This comes down to what to leave in and what to leave out. It’s a storytelling dilemma. Too much and it’s predictable. Not enough and it doesn’t appear to make sense. Gatsby had not enough. It opted instead to embellish on Nick’s endless monologue, explaining and explaining instead of showing us who Daisy was, and why she could bring herself to abandon Gatsby in favor of a lesser man, a cheat, liar, spoiled blue-blooded jock. Class is central to the story, and it is a bit of an indictment against the blue bloods -- Daisy included. Conspicuous consumption is set against squalor and poverty. Poverty creating the wealth, the parasitic nature of the elites, is not really connected. In this way Gatsby’s excesses are excused and glossed over as fun. As the narrative seeks to make points about class and elitism, it does have a nagging issue with Gatsby’s own excess. It seems to say that he can get away with it because he’s a nice guy. Ergo, obscene wealth is not the problem, it’s just the attitudes of the “old guard” elites. I do not agree with this position, which is probably Fitzgerald’s, as well as Luhrmann’s. I find that a hollow argument to try and make actually. Obscene wealth is obviously dependent upon obscene poverty to grind it out, mine It out of the earth, process it and build it, ship it and serve it up at the master’s feet. To not acknowledge this basic economic truth is… well another discussion. On that note, the modern day rapper ethos appears in the film. This anachronistic nod to current excess and public worship of Mammon is an interesting choice. I agree that these current bling obsessed personalities are as revolting and offensive as their Gilded Age forebears, perhaps more so, but I have no idea if the filmmakers agree. Are they critiquing it or reveling in it? The film is a lucrative vehicle for Jay Z to sell a lot of units. Lastly, I would be remiss if I didn’t complain about the camera choice. The current Red sensor doesn’t really appeal to me. It never has. I don’t think it’s a good look for cinema, and the colorists go to all kinds of ridiculous degrees to paint it and tweak it – but the camera still needs to capture it well in the first place. I hated the look of the faces most of the time in Gatsby. The skin tones are phony and annoying. The texture is also too smooth and artificial, as if a computer made the images (it did). The Red puts this distinctive look on its images, and it’s a look I seriously despise. Get it out of there. Yuck. Camera zealots will blame the director, cinematographer, colorist or somebody, anybody but the camera itself. Worse they’ll claim they love the look. What can you do? The human capacity for self-delusion, as proven by Jay Gatsby, is limitless. Quite a thought-provoking film. I’ll have to read the novel.